Here at Blatant Media we are focused on one primary goal – To Build Intuitive Software! This was our goal back in 2003, and it’s the filter through which we look at every new feature that we build into Absorb today. As you have probably heard, Absorb underwent a major redesign last year. As part of that effort, we re-examined every feature in Absorb for usefulness and “user-friendliness”. One of the great things to come out of that effort is our new administrator Side Bar menu, or what I like to think of as “Actionable Reports”. 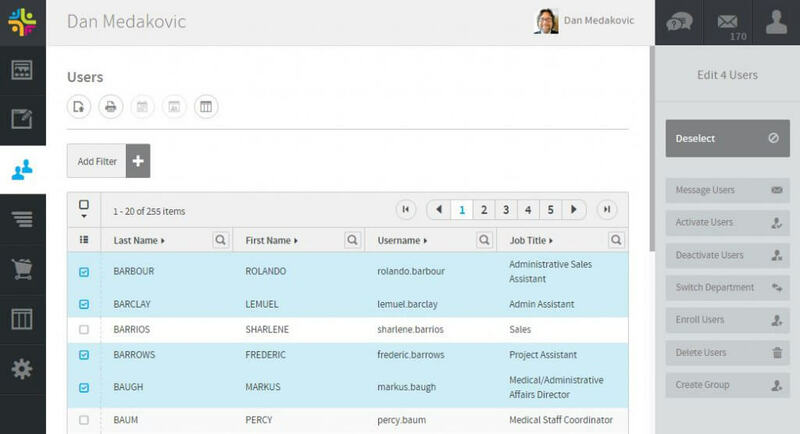 The Side Bar menu appears whenever you select an item or items from within an administrative report. We’ve know that Administrators don’t just run reports to look at data, they want to be able to quickly and easily act upon it, without having to hunt through menu optoins. The context-based Side Bar menu provides options relevant to the report type and item selected. For example, if you are in the Users Report and you select several (or all) users within the report list, the Side Bar menu instantly gives you shortcuts for common user management tasks such as Message Users, Activate or Deactivate Users, Switch Department, Enroll Users, Delete Users and Create Group (from the selected users). Another example is the Course Activity Report. Selecting a single user from a course Activity Report provides shortcuts to Edit User’s Course Activity (including scores and attempts), View User Transcript, Edit User, Message User, and View (all) Enrollments for that user. These are only two examples of the many shortcuts provided by the Side Bar menu. Other time-saving features in Absorb include “Set it and Forget it” Availability Rules for all content, and Auto-Enrollment rules for courses. How easy-to-use is your current LMS? Try Absorb LMS for yourself and see what it can do. Sign up for a free instant demo portal of the learner interface and our team will help set you up with full software sandbox access.